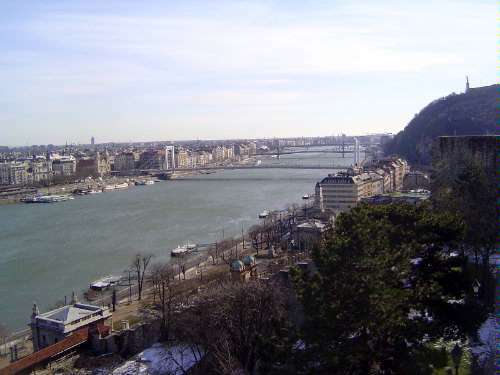 Dare we explore Budapest on our own? 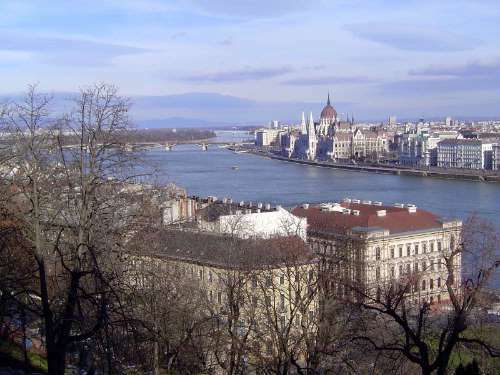 A city we've only heard of and hardly know? A city where we have less than two days to look around? Foolish question! If "36 hours in X" works for The New York Times, it's good enough for us. Besides, we're armed. Here it is, our trusty 1911 Baedeker's Austria-Hungary, topped up with 1999 Budapest 2000, a re-photography project with old photos from Klosz Gyorgy matched by new ones from Lugosi Lugo Laszlo. What more could you want? 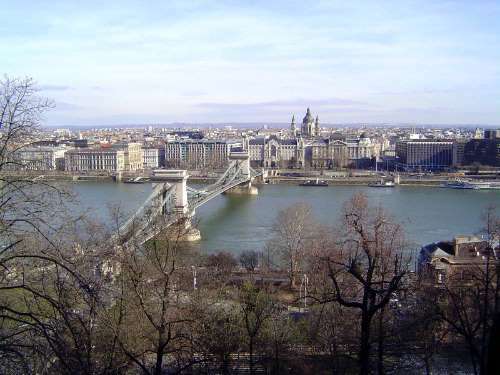 Yes, yes, if you insist we'll take Edwin Heathcote's cute little Budapest (1997). Time to cross over. 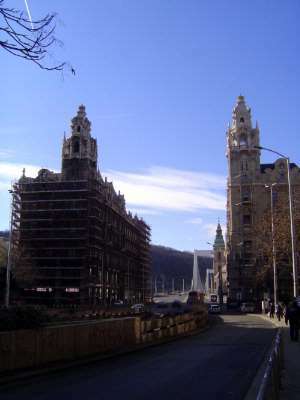 Here, from near the river, is the Chain Bridge again, along with the Gresham Palace and its more traditional twin, which houses the ministry of local government and regional development. 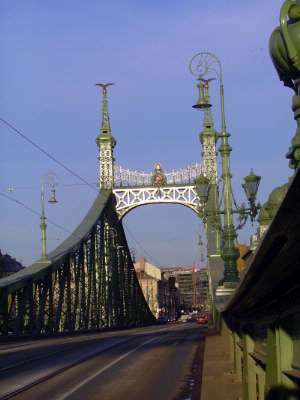 The bridge, opened in 1849 and the city's first permanent one, was a catalyst for urban growth. 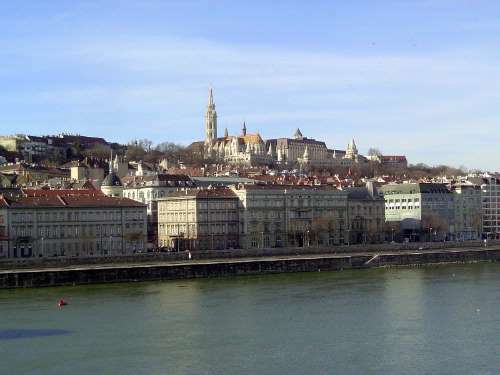 We're looking back to the Buda side, from where the previous pictures were taken. 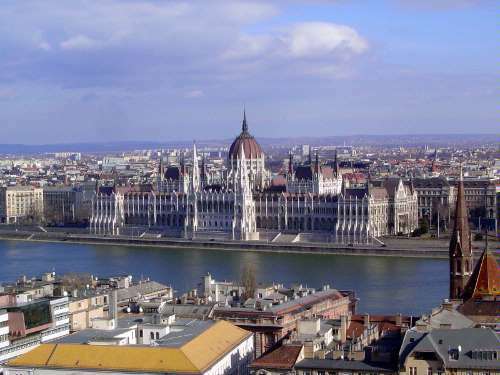 The church is now the Matthias Church, after King Matthias Corvinus (1443-1490); the name in Hungarian is Hunyadi Matyas. 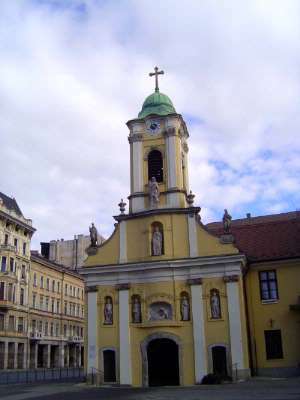 In Baedeker's time this was the Coronation Church, because it was here that Franz Joseph was crowned King of Hungary in 1867. Long ago and far away. And here is the sprouting and budding Gresham Palace, in Heathcote's words "a complete synthesis of architecture and the applied arts." 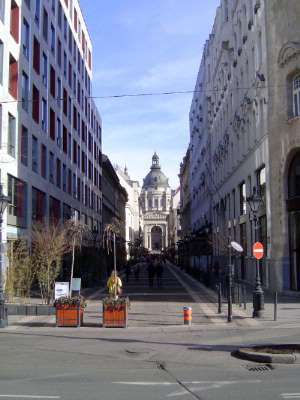 A mall stretches east to St. Stephen's, rebuilt in 1873 after the collapse of an earlier dome. Here it is, straight on. 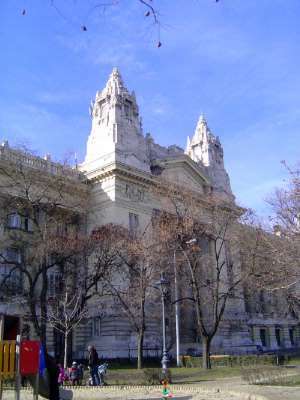 Completed in 1905, the design was by Ignac Alpar, originally a stone mason and later an assistant to Imre Steindl, designer of the Parliament. 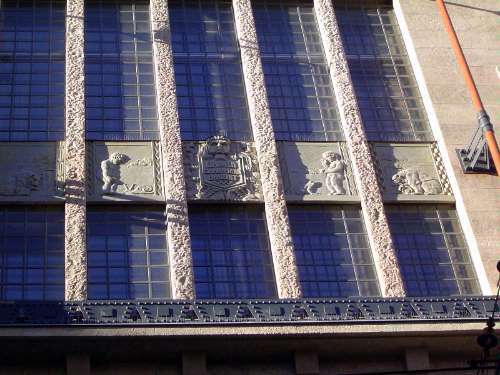 Alpar's background shows in these details on the bank. 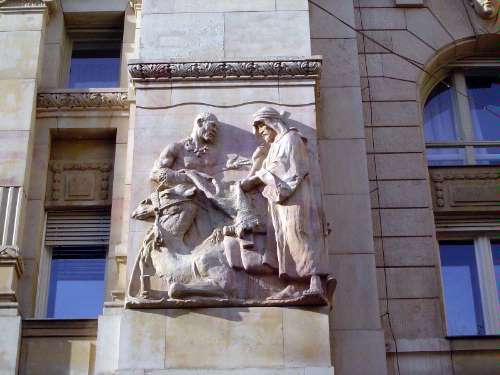 The reliefs are by Karoly Sennyei and show a range of wealth-producing activities. This was a bank apparently with global interests or at least ambitions. 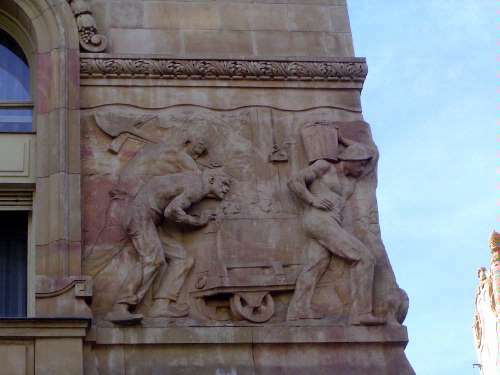 On the western side of the square is this giant from 1898. Heathcote calls it a "magically monstrous creation." 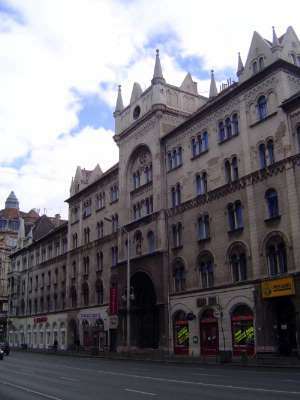 It was designed by the very prominent Miklos Ybl (1814-1891) and opened in 1905 as the city's stock and commodities exchange. 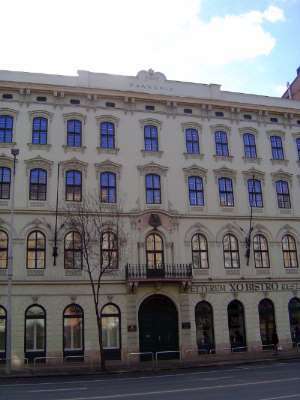 After the Soviet takeover, the building became the Lenin Institute, then the home of MTV. (No, no, not that MTV. 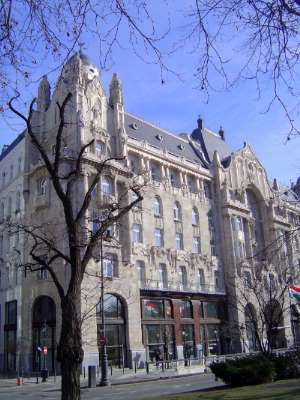 This would be Magyar TV.) Since then, there's been a scandal, with MTV selling the building in 2006 to a Canadian firm that hired Beyer Blinder Belle to produce a plan for adaptive reuse, only to find the new owner renting space back to MTV, which still needed a home. 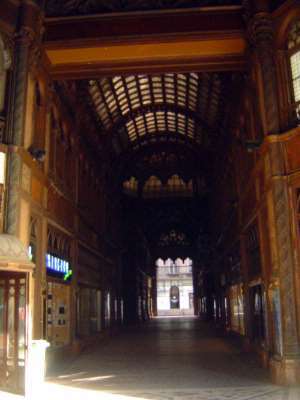 The building is hard to photograph because the most extravagant element is the roof. 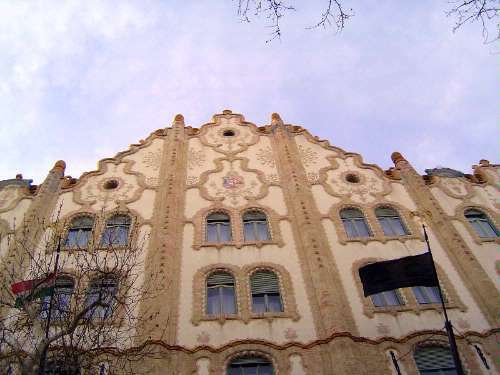 You can see why Lechner picked up the label "Hungarian Gaudi." Heathcote writes that the roof is "alive with green and yellow Zsolnay ceramics" portraying serpents and dragons. 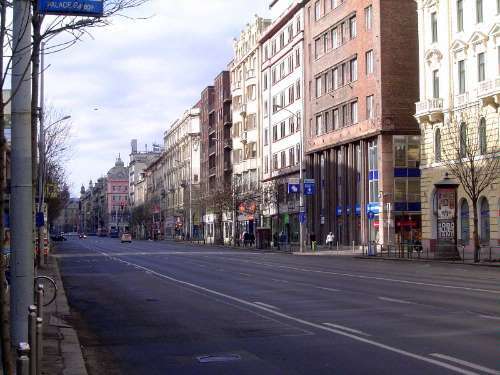 Most of the city was far more conservative, as for example here on Andrassy Avenue, named for Count Julius Andrassy, at one time Franz Joseph's foreign minister. 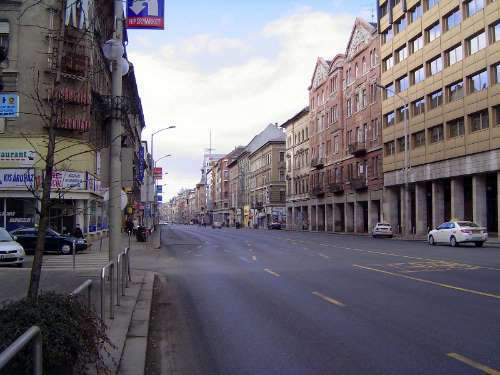 Baedeker, proud as punch, points out the resemblance to Vienna's Ring-Strasse. 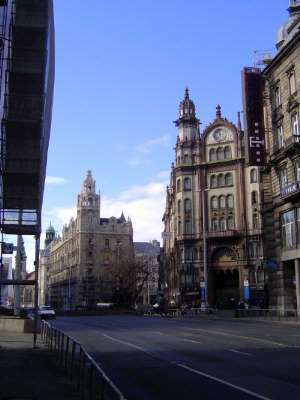 The street's grandest building is the opera house, completed in 1884 to a design by the same Miklos Ybl who did the stock exchange. 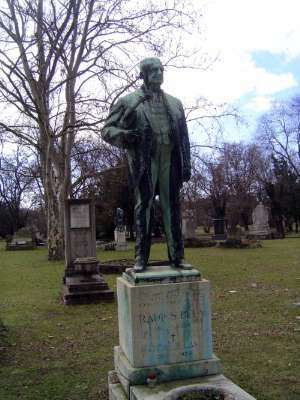 He lived long enough to see Gustav Mahler conduct here. 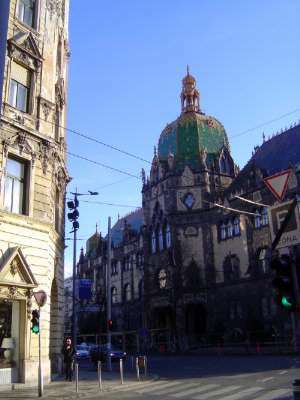 Appointed director in 1888, Mahler left two years later for Hamburg. Perhaps the failure of his first symphony, whose premiere here fell flat, had something to do with his departure. 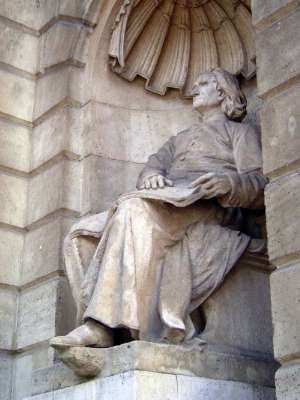 Unmoved, a cross-dressing Franz (Ferenc) Liszt looks up from a score. 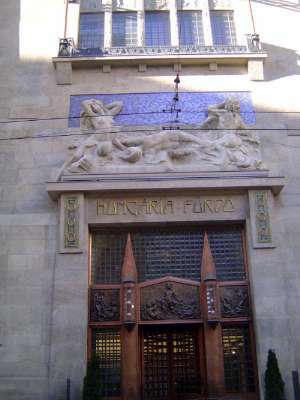 Twenty-five years later comes the Parisiana nightclub, designed by Bela Lajta and opened in 1909. Heathcote calls it an "absolutely stunning structure which dazzles the eye when seen from the grand, pompous opera building opposite." 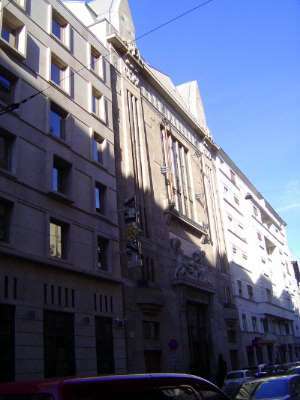 The building was altered in the 1960s but restored to its original form by 1990. Heathcote writes that Lajta "revelled in the visual languages of archaic civilizations." What else is unusual? 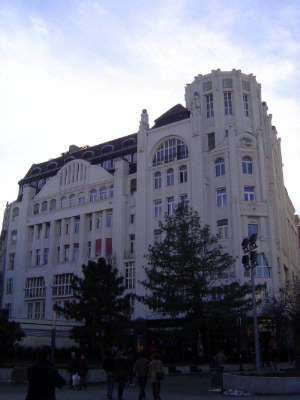 At a prime location but stripped of its cupola and (presumably) its original color scheme, this was once the Modern and Breitner department store, from 1912. 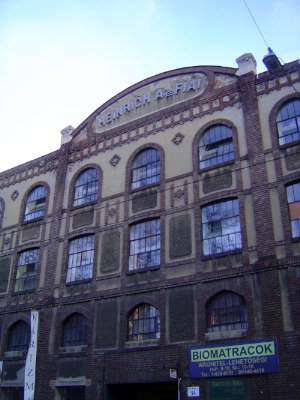 It remained a department store during the Soviet period, when it stocked goods from behind the Iron Curtain. 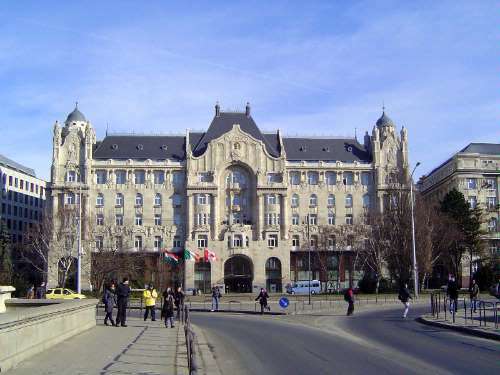 It's the Hungaria Baths, now the Continental Hotel Zara. 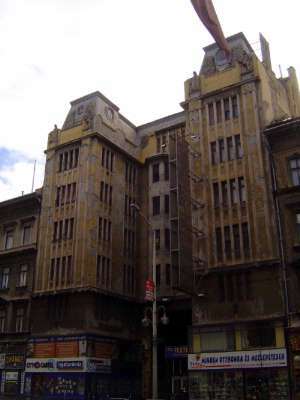 The building is a copy of the original, built before 1910 and later abandoned and left to decay. 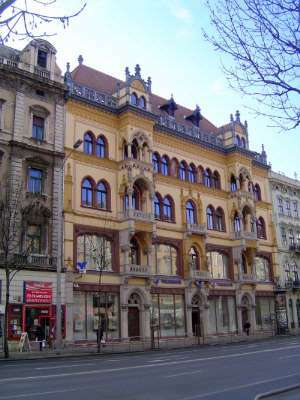 Too deteriorated to be renovated, the original building was destroyed in 2008, but the replacement recreates the original sculpture by Sandor Krisztian. We're on our way to something highly exotic, but how's this for a factory? 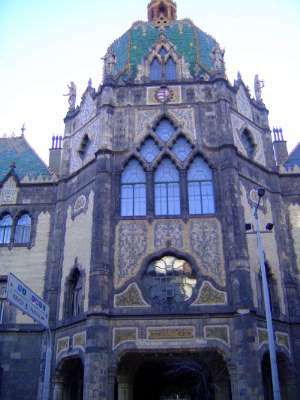 Here we are, the Museum of Applied Arts by Odon Lechner (soon to design the dragon-and-serpent-topped Postal Savings Bank) and Gyula Partos. 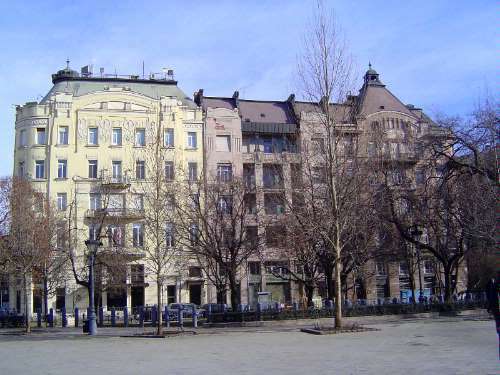 The building commemorates the celebration in 1896 of the arrival of the Magyars a thousand years earlier. Like the Postal Savings Bank, this building, too, has a steel frame. Draped on that skeleton? Heathcote calls this "probably the first major museum in the western world not to be executed in a historicist style." 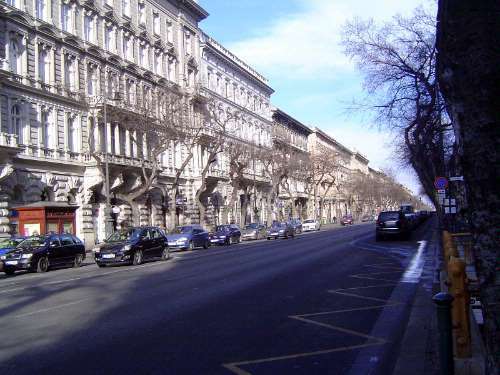 Back to meat and potatoes, here in the form of a stroll along the Rakoczi (or Rakoczy) Ut, a street named for a Hungarian family exceptionally wealthy until one of them took part in an anti-Habsburg uprising. 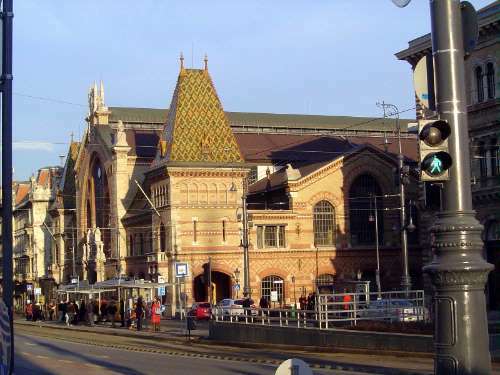 The street connects the Elizabeth bridge to the main railway station, 1.5 miles to the east. 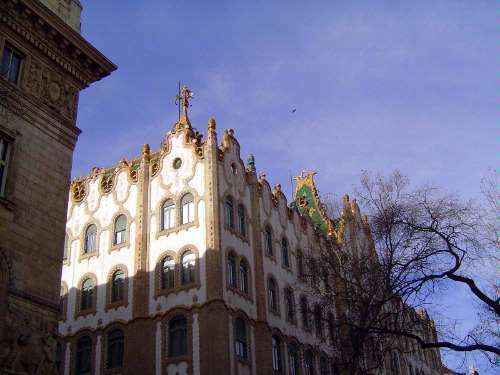 Seen individually, the buildings are more varied than you might expect. Some buildings are a handy reminder of how the city must have looked in its grimmer Soviet days. Others have been fixed up. Here's something else that's unusual along the same street. 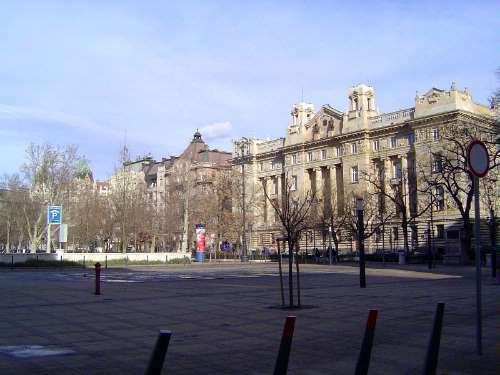 It's part of the Rokus Hospital, begun in the 1710s as a plague hospital. 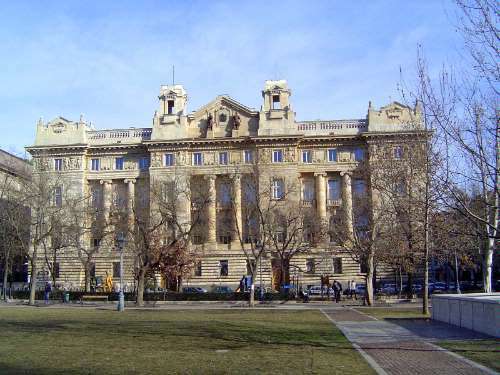 The Ervin Metropolitan Library, 1904, was named for its first director, Ervin Szabo. What! Not for a donor! Here we are, last stop before the bridge. 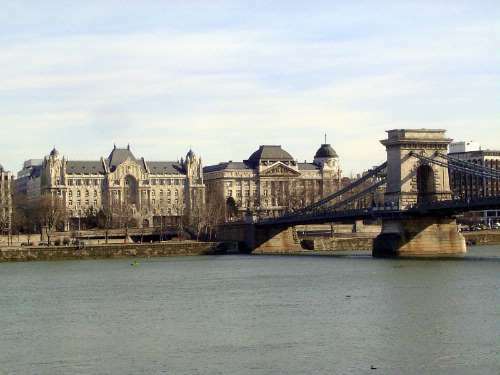 Opened in 1900, the bridge made this prime property, which is why Klotild Maria Amalia, a grand duchess, bought the land in 1899 and asked two architects, Korb Floris and Giergl Kalman, to build a pair of palaces. 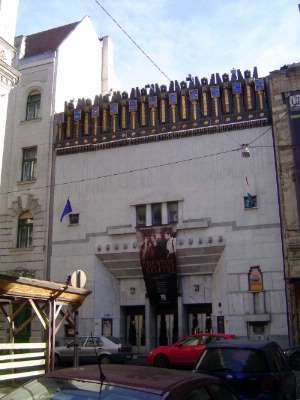 They complied, thoughtfully naming the place the Klotild Palace and putting ducal crowns up top. 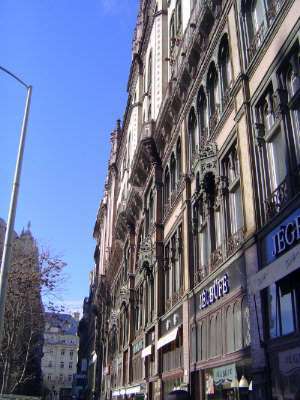 The buildings in 2011 were under renovation by an Italian firm transforming them into a combination of retail spaces, offices, and residences. A more unusual building is next door. 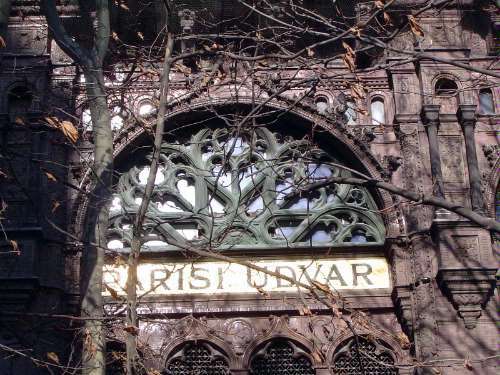 It's the Parisian Arcade (Parisi Udvar), completed in 1913 and the work of Henrik Schmahl, a stonemason. 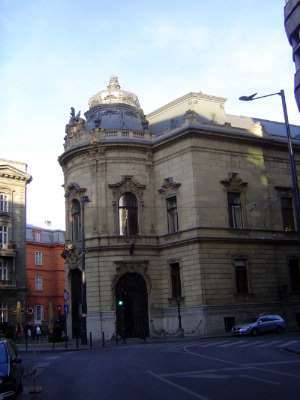 Originally it was the home of the Inner City Savings Bank. It survived World War II but in 1948 was nationalized. 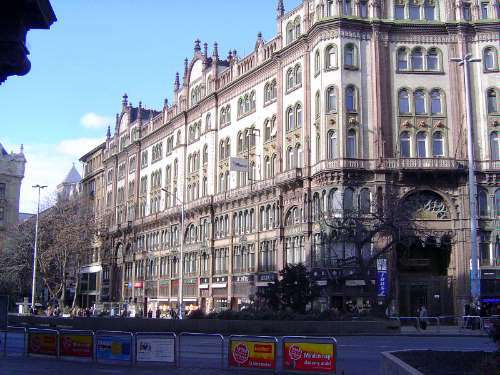 Now it's being transformed by the Platinium (sic) Group into a hotel combined with apartments. The architects at work here today refer to the building as in "Venetian Gothic with Islamic elements." Tympanum over one of the entrances. Of course, we'd all like a better picture, but this is what the cook made for lunch. "Please, sir, I'd like some more." 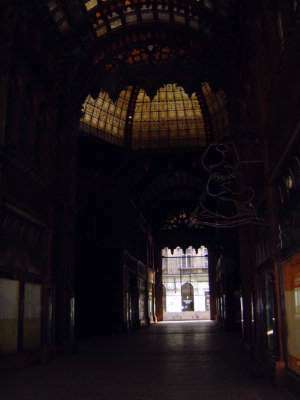 The interior: three floors of it. 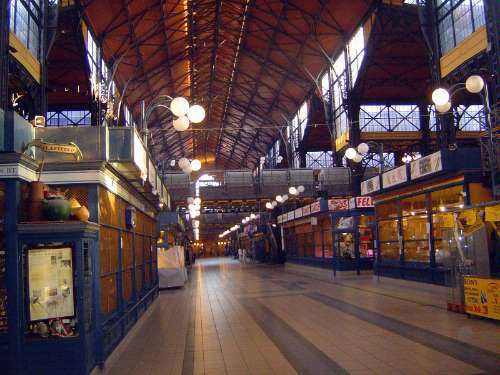 Goods were originally delivered by a canal that ran along the central axis of the building's ground floor. 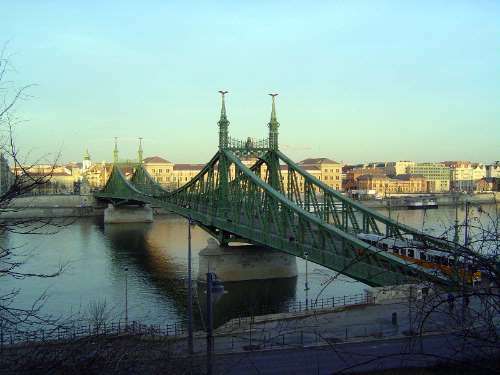 Like the Museum of Applied Arts, the Liberty Bridge was opened in 1896 to mark the Magyar's thousand-year occupation of this land. Originally the bridge was called the Franz Joseph Bridge, and it was he who opened it. The name's changed now, of course, but those birds are still up top. You didn't notice them, or think they were significant? Wrong. 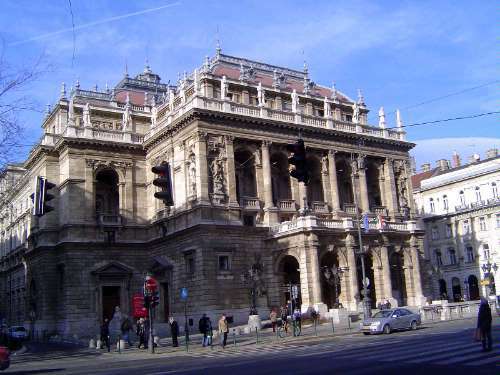 They're Turul Birds, embedded in Magyar mythology as bearers of divine messages. They alight in the Tree of Life and are accompanied by smaller birds bearing the souls of children to come. 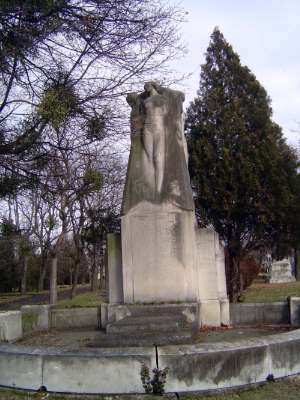 Speaking of souls, we should venture out to the famous cemetery near the main railway station. 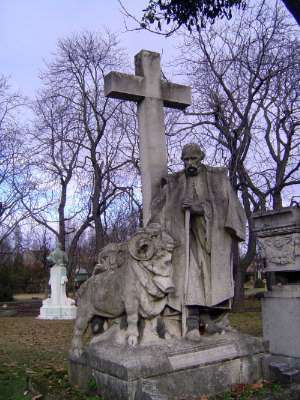 There are many elaborate tombs here, such as this one for Gyorgy Rath, whose Oriental art collection is now on display in the Budapest museum of his name. 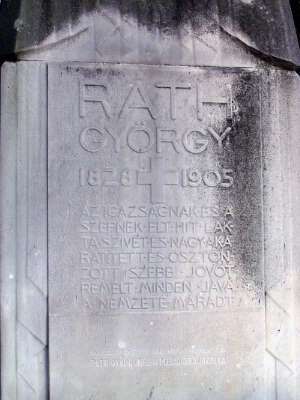 Rath Gyorgy/ He lived for truth and beauty/ Faith dwelled in his heart/ He had a strength of will/ He acted and shared/ He hoped for a better future/ He left everything to the nation. 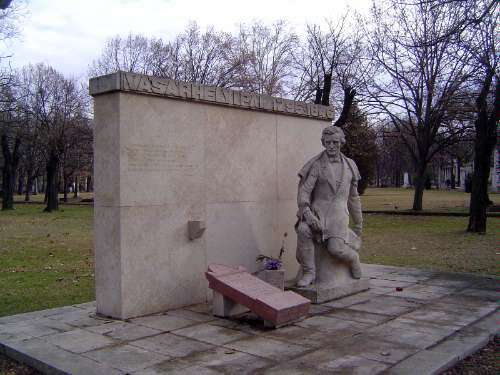 Here, representing the right brain, is the tombstone of Pal Vasarhelyi, an engineer who made the Danube navigable from here to the Black Sea. And here, the painter Bela Pallic. The ram is not accident. Pallic was most appreciated for his pictures of farm animals. 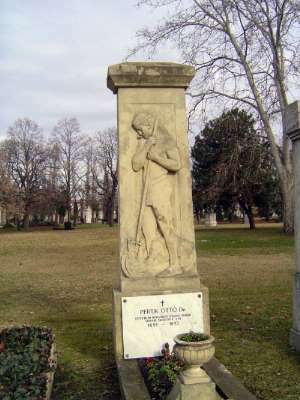 Vagi Imre Szazados 1896-1923. Occupation unknown. And again, despite the musical notation. 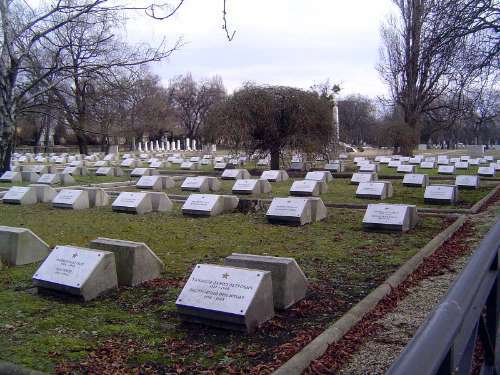 Although the cemetery, established in 1849, is something of a pantheon, it's also sinister because of the many graves from the Soviet period.